On Sunday June 26th the extended Dr.Backup team got together for our annual Seafood and Crab feast. This year, we traveled to Mike’s Seafood restaurant in Riva, Maryland – overlooking the South River and a stone’s throw from the Chesapeake Bay. After a “brief” staff meeting, the chow-down began. 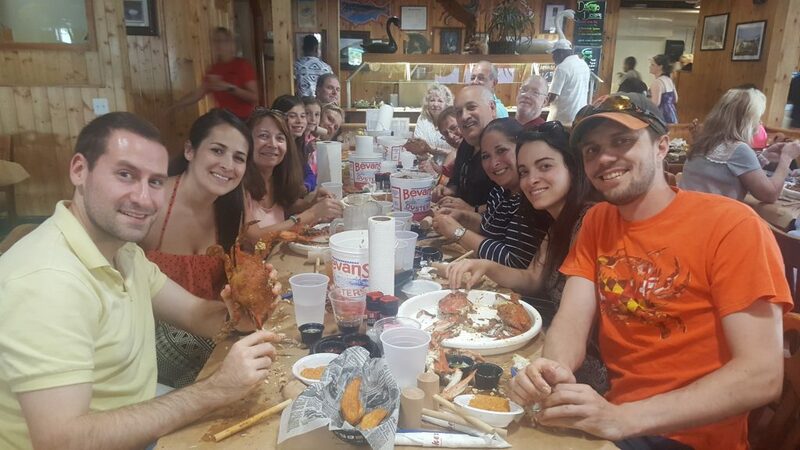 As a “team” we managed to consume 3 dozen extra large crabs, several pounds of shrimp, crab cakes, fried clams, chicken fingers, shrimp “poppers,” fresh fish, chicken wings and southern style fried hush puppies! Beverages of course were varied and ranged from orange “crushes” to imported beer — some with unpronounceable names. Water, iced tea and sodas were available for our designated drivers! Going around the table, from left to right, were: Jeff, Brooke, Janet, Gentry, Brighton, Janet, John, Suzie, Steve, “TK”, Sherry, Mitch, Susan, Ashley and Kevin. Whew, quite a hungry crew! It was really great getting everybody together in one place for a happy time – sure beats scrolling through thumbnail pictures of “friends” on Facebook. A special shout-out to some new faces prominent in the crowd this year: Gentry and Brighton – no doubt future Dr.Backup interns! Of course the day wouldn’t be complete if it wasn’t dotted with a dose of reality. Just as the event was swinging into high gear, our after-hours pager advised us that a client needed an emergency restore of their server files. Never a dull moment at Dr.Backup!